Here is an edited excerpt of a letter that I sent to a long time friend who lives near the Canadian border in northern Washington state. I cut out the personal stuff. Since my dad's illness and passing, I have not been up to visit much so I wanted to bring him up to pace. It gives a decent executive summary of my last year with CLL. I have cut some corners with the data and details, but it paints the picture, and it at least for me, it is a prettier picture these days than it has been in a long time. After the letter is my commentary of what I believe are the significant unmet needs as related to ibrutinib and other similar drugs. I talk mostly about ibrutinib because it is what I know best, and believe at least for me was the best possible choice. It’s been too long since I last brought you up to date on my latest “trials” with leukemia in particular and life in general. It has been a wild ride for sure. Your parting wish to go with gusto was certainly prophetic. Despite my best efforts to make peace with my cancer with a calming diet and a calmer lifestyle, my evil clone has mutated to a more aggressive form. Fatigue, huge nodes, and malaise. In one of my more prescient and courageous acts, I was fortunate to win a fight with my HMO to get authorized to grab one of the last openings in clinical trial at Ohio State with what now appears to be a game changing medication. I have been commuting to Columbus for months now. My nodes melted to half their size in the first 30 days while stamina and sense of well being rebounded. My new miracle pill, ibrutinib doesn’t kill the cancer, but it controls it- similar to insulin in diabetes. Stop taking it and the cancer can jump right back at you. You would appreciate the way it works. It blocks critical communications with other blood cells. Think a whole cell condom. Cancer birth control. The cancer cells lose their support network, become unanchored from their safe niches in the lymph nodes and bone marrow and float aimlessly in the more exposed and vulnerable reaches of the blood stream. At first, the white count shoots up as the cells depart on mass from their lards, suggesting disease progression, but a few months later the counts falls as the clone dies of loneliness (actually lack of pro-survival and pro-proliferative signaling). And the more aggressive the cancer, the more it likes the crosstalk, and so the pills may be most potent on the worst leukemias. Response rates are > 90% in tough refractory and relapsed patients. And because it is not a killer, there are few side effects. It’s still an early story, it’s probably not a cure, and it’s only available in trials to the many who need it. And many more need it than can get it. Access is the big problem now. And it may persist into the future as well. I am doing great, and so are many others I know that are in clinical trials at OSU or the NIH or elsewhere. But thousands are not doing so well and might benefit from ibrutinib and others like it. For some, there time is running out. The many emails and posts about how to get into a trial or compassionate use are testimony to this tragic unmet need. There are other needs too. Less pressing today, but maybe more significant in the long run. We need robust data. For how long and for how many will it work? Are some combos better than others? Will new side effects emerge down the line? Who will relapse and how will those relapses look? These are only some of the many unanswered questions. The answers will take time, often many years. All of it will take carefully planned and conducted trials. That means strict inclusion and exclusion criteria. That means that too many patients who have exhausted their options will have no ibrutinib or similar trial to turn to. We need to get this and other similar drugs FDA approved as soon as possible. That starts by filling all the spots in the pivotal trials, even when the chances to get ibrutinib are only 50/50. The phase III trial is the acid test, the potential proof that this BTK inhibitor meets, at a predetermined significant level, an unmet need or that it exceeds what is out there in terms of an agreed surrogate markers for what we all really want - longer progression free survival. Right now no-one has been on it much more than two years, and only a few hundred people in the whole world have ever swallowed the battleship grey pills. It’s a small and short cohort. We have so much to learn and the phase III data will be a huge boon. Once it is approved, probably in a few years, the restrictions then would be from the payors (Medicare and private insurers) who might not limit the use of the drug, but who could refuse to pay for any therapy that even slightly deviates from those for which it was licensed. If it is priced anything like Revlimid and other new oral cancer drugs, that could effectively put the drug, out of reach for most of us. We would either have to match the exact indication on the package insert and perhaps even more age and health restrictions demanded by the insurance company, or we would have to be very rich. Accordingly, we may need to push to improve access again, even after it hits the market. And that is not the end of the story. When it on the market we will still need to ask our friends in the pharmaceutical companies and the research institutes to keep looking for better drug combos and new compounds so we can cure our disease once and for all. We all need to work together- patients, providers, advocates, payers, academics, government, foundations, and pharma to get this done. We always know it would be a long journey. And the pace is frustratingly slow, but for the first time ever, we just might be seeing the finish line. And that is a very pretty picture indeed. Please let me know what you think, what needs you see, and your ideas on how we might meet them. Yesterday I lost a dear young friend. I saw her the day before she died. After my wife, she was probably the most important woman in my life for the last few decades before my transplant shrunk my work world. A wise, rock steady healer. A constant friend. Her disease was not CLL, but another chronic illness that waxed and waned. It gathered steam over the last few weeks, reached a crescendo in the last few days, and in the end, it proved too much for her. I am so sad for her children, her family and friends and the thousands of those whose lives she touched and helped through her smart and gentle work. 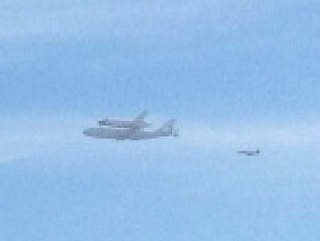 Today I saw the NASA shuttle, Endeavor, do a low slow fly-by in Oakland on it's farewell trip through space. Like Endeavor, I will never see her fly again. There's a gaping hole in my heart. I will be OK. I have lived with tragedy and death before, but there are some hurts that never heal. Usually boring is the best way to be. No bumps in the road. No drama. I saw Dr. Kipps last week and with his deeply delving fingers he was able to unearth some cervical nodes that no-one, not even the owner of this body, has ever felt. But they were all small, less that one by one centimeter and maybe smaller than 90 days ago. When they are that size it is hard to tell if there's been any change. My counts were still good. The neutrophils were back to normal after the jump up from my burst of methylprednisolone for the fluid behind my right eardrum. My platelets were over 400,000 and my Hgb was 13.8. All good stuff. The CLL is still there but it is behaving itself. It's pretty stable, moving sideways at worst and more likely improving at a glacial pace. The only trouble on the horizon is that my right ear is clogged up again. Seems that the steroid fix was only temporary so my family doctor suggested a trial of Afrin. It only helped a little and I needed to stop to avoid the rebound swelling that happens with extended use, so it's time to consult an ENT. I am less worried about it, as it is not progressive, easy to knock back, and mostly just annoying. Still time to check it out and make sure there is no structural problem. He may want to put a ventilation tube in, so I better get my surfing in first. I am down to one infusion a month of IVIG here, and one more blood draw at OSU. That's more good news as my veins are pretty battered after so many years despite all my efforts to protect them. Let me give you a sense of some of what I see happening in CLL just with people I know. In this week alone, I learned that a friend, Chris Dwyer of CLL Canada has developed Richter's Transformation. Heard from another long time CLLer with both AIHA and ITP. After having curative surgery for lung cancer, some else is fighting to get back in the NIH ibrutinib trial which helped her knock back her CLL big time. I had dinner and a wonderful visit with a pal from the east coast who is doing great post transplant at MDACC for both CLL and MDS. Another long time local friend is considering the phase three trial of ibrutinib versus ofatumumab for his relapsed CLL. I said go for it. Talked with a young Asian woman who was diagnosed in her twenties. And this is supposed to be a disease of old white men. And I connected with two CLL widows. Not fair. It's not fair, any of this. Sometimes the CLL is the least of our problems. I am back in Ohio in a week. Let me know if you will there too. L'Shana Tova to all my Jewish friends. May it be a year of peace and good health, May this be the year we see a cure to all cancers. As for myself, at this time of self reflection and self improvement, I plan to double down of getting the word out about CLL to patients and providers alike. But first I need to visit my granddaughter. And for something a big more upbeat than CLL, I am growing my own organic tea. We have two beautiful camellia sinensis, variety sinensis bushes each about two feet high. Tried my first cup. Picked a few leaves that had fallen off or been injured in transit, let them wilt in the shade for a hour, steamed them for a minute, dehydrated them at low heat, and then brewed the crispy leaves at 175 º for exactly 75 seconds. A rich smooth flavor, a lovely golden color, an almost silky taste in my cup. I am in heaven. Why didn't I try this before? I will need to let them get much bigger before I can harvest enough to meet my "habit" and must avoid for now picking the new tender growth that makes the best tea, but it's a good start. It's always good to be starting something new. Seven years ago my wife and I were happily planning the home wedding for my oldest daughter. Now that marriage has given us our number one granddaughter who applauds her own first time success at standing up. Today. It is so good to be alive. Seven years ago, odds were not looking so good that I would reach this day. I am one lucky soul. Seven years ago, it started so innocently. Some lumps at the back of my neck at the hairline. Soft, mobile, not tender. The symbol for cancer is the crab, with its pincers grabbing and invading. A tenacious rough visitor who clings to its hard won territory and gets ready to expand its reach. This felt nothing like that. These were smooth and rubbery, but persistent. I was overdue for lab work so I ordered blood work on myself (one of the advantages of being a doctor) including the usual lipid panel and blood chemistries and a CBC on September 7, 2005. The next day, Sept 8, 2005, seven years ago today, rocked my world. I remember being happy that my cholesterol was so good, and that my chemistries were are fine. What did that matter when my white count was way too high and it was all lymphocytes? While it would be more than a week before the final diagnosis was confirmed, that day everything changed. A disease enters our life when we decide we have had enough of the worry or the uncertainty or the pain or the itch or the whatever. The limit of tolerance or the limit of anxiety has been exceeded and we need relief, but it comes with a price tag. We seek help. We consult a doctor who makes a diagnosis. Many of these labels, a sprain or bronchitis or a migraine are temporary. Many are not. Professor Ian McWhinney, the father of family medicine in Canada, and one of my mentors laid the groundwork of this understanding about how a word, a disease comes to our lives. Some maladies are amorphous, nameless and usually evanescent. All the bad one ones have names. and if it is compounded, it's usually really bad. Get scared if it's three words long and the first word isn't benign. My three letter monster, CLL or chronic lymphocytic leukemia has been my traveling companion since that fateful day seven years ago. No, that's not right, because more than once it has been the driver, grabbed the steering wheel and heading us over a cliff until I could wrench back control. The first time was when another three letter hitchhiker, ITP squeezed into the front seat and sent us careening towards the rocks over and over again. Cancer patients talk about pre and post diagnosis as different universes, as an epic paradigm shifts whether we want one or not . We talk about "the new normal". We talk about altered priorities, lost trivialities, and new imperatives. A cancer diagnosis has the opportunity to be a crash course in everything. I quoted before from the late great Gilda Radner who said about her cancer: If it wasn't for the downside, everyone would want it. But what a downside! Let us be honest. It comes with the real risk of intractable pain, increasing disability, bankrupting expenses, unimaginable inconvenience and stolen time, overwhelming fatigue, annoying side effects, unknown fears and of course death too soon, too soon, too soon. The upside too is amazing. Life becomes purposeful, more focused, more urgent, more timely. The junk melts away. New friends and challenges and interests and opportunities appear. A brave new world. A chance to make a difference, a chance to beat the odds, blaze new trails and drags others with us on the road to, dare. I say it, a cure. It seems possible now. The accepted wisdom is that the only possible path to cure for CLL is a transplant. Maybe that is changing. My transplant failed, as it does for about half of those who go that route. And it kills and mains too many. Maybe the ibrutinib or GS1101 or GA101 will buy me and others the time needed for the CLL gurus to perfect the CAR-T or the next winning cocktail to get us to the promised land of no more leukemia, forever. Much has changed in the seven years since my diagnosis. Then they was no therapy even shown to slow down the disease or add a day to survival. Options were limited to toxic drug combos or the go for broke transplant. With my nasty mix of 11q deletion, complex karyotype, CD38+, elevated B2M. strongly positive ZAP 70, 100% unmutated, aggressive ITP, and the recent addition of the worst or the worst, 17p del, I have more than beaten the odds. I should be long gone. But instead, I am feeling stronger than ever with less fatigue, with blood counts near normal and nodes that are getting harder to find. Seven years out and I am charging ahead to see how I help more CLLers get the best possible care and push the scientists to not take their feet off the accelerator. We aren't there yet and our path is not yet clear, but we are closer and the palliative options are increasingly gentle and effective. This is all good. Although there are no guarantees and everything could chance in a heartbeat, and moreover, G-d forbid, I don't wish to invite trouble through trumpeting my good fortune, but the truth is that seven years out and my life has never been better and my hopes for all us CLLers have never been higher. I am so grateful to all of you who follow along here and elsewhere and who share your stories. The best is yet to come. Please stay the course. Our future is bright. My granddaughter stands up for the first time and applauds herself. Does it get any better. I see where President Clinton stole my best line at the Democratic convention. But I stole it first.